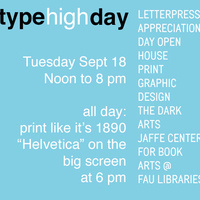 Each year on the 18th of September we celebrate Type High Day, which has its origins in the height of type. All of the metal and wood type we use in letterpress printing, from the very smallest to the largest, measures an exact .918 inches in height. We’ve been celebrating Type High Day with a Letterpress Appreciation Day Open House for years now… come join us for this 9th annual celebration! COME PRINT! Come on over during our open house and print like you mean it using one mean press: We'll be cranking out prints Benjamin Franklin style on JCBA's 1890 Wesel Iron Handpress and you will be the printer. You'll print a broadside (a poster, basically) that we’ve typeset from JCBA's collection of historic wood and metal types while we teach you a bit about this fascinating craft. The poster is yours to keep and printing it will teach you the difference between clicking PRINT and actually PRINTING. Our Letterpress Studio is home to an assortment of historic printing presses, all of which are actively used by students and visiting artists to create hand-printed books and literary broadsides. FREE! This ninth annual open house is a free event, though donations to the non-profit Jaffe Center, which is focused on artists’ books and the study of hand papermaking, letterpress printing, and bookbinding, are encouraged. (In keeping with the spirit of Letterpress Appreciation Day, might we suggest gifts in multiples of $9.18?) Cash, checks, and major credit cards are accepted for both donations and purchases. Of course we appreciate your support, but your presence is more important to us than your donation. Jaffe Book Arts Gallery. Self Determined Admission: you decide the price of your admission. 80 minutes. Directed by Gary Hustwitt, Swiss Dots Films, 2007. Changing the world, one letter at a time… Helvetica is a feature-length independent film about typography, graphic design and global visual culture. It looks at the proliferation of one typeface as part of a larger conversation about the way type affects our lives. The film is an exploration of urban spaces in major cities and the type that inhabits them, and a fluid discussion with renowned designers about their work, the creative process, and the choices and aesthetics behind their use of type. Helvetica encompasses the worlds of design, advertising, psychology, and communication, and invites us to take a second look at the thousands of words we see every day. Interviewees in Helvetica include some of the most illustrious and innovative names in the design world, including Erik Spiekermann, Matthew Carter, Massimo Vignelli, Wim Crouwel, Hermann Zapf, Neville Brody, Stefan Sagmeister, Michael Bierut, David Carson, Paula Scher, Jonathan Hoefler, Tobias Frere-Jones, Experimental Jetset, Michael C. Place, Norm, Alfred Hoffmann, Mike Parker, Bruno Steinert, Otmar Hoefer, Leslie Savan, Rick Poynor, Lars Muller, and many more. Visitor Parking is available at the metered spaces in the library parking lot; there are “metered parking” signs posted at the head of these parking spaces. The meter system accepts payment with cash or credit card at the rate of $2 per hour. You may also purchase one day parking permit for $5 online directly. Easy! Start here: <http://www.fau.edu/parking/permits.php>. Then click on “Visitor, Guest & Volunteer Parking / Permits” … you’ll find it with a yellow icon just below Student Permits and Faculty/Staff Permits. As far as the library goes, these permits are valid anywhere throughout our nearby parking areas (Library Lot, Parking Garage, and parallel parking on Volusia Street) but they are not valid at metered spaces.